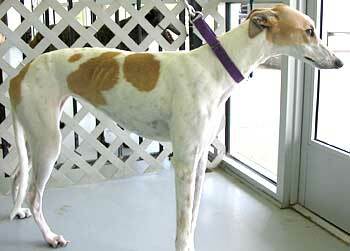 Lady Grey is a gorgeous light fawn one-year-old female greyhound. Lady Grey was an owner surrender to GALT; the owner had her since her puppyhood, but could no longer care for her. Lady Grey is as beautiful on the inside as she is on the outside. She is very playful and affectionate. Lady Grey appears to be small animal tolerant. Lady Grey is a very gentle lady. 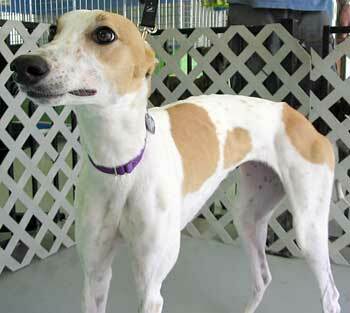 She is very sweet and beautiful - a bit on the smaller side as compared to other greyhounds. Lady Grey walks well on a leash, and she knows how to use the doggie door. She will eventually go into her crate after you give her treats. She whines a bit when she first goes in the crate, but soon settles and goes to sleep. She loves treats and always eats her food. She plays very well with all my dogs, especially the puppy. She does have a tendency to get overly excited when she plays, and would benefit from a little training in that department. e.g. learning a little self control. There is still a lot of puppy in this girl! She does well with my small 7 lb dog too. She can play and play for hours. However, she is just as content lying on the dog bed or couch sleeping so long as you are in her company. She has not had one single accident in the house or in her crate. She enjoys just hanging out. She rides well in the truck but tends to want to come to the front seat. She is very affectionate and loves people. She will approach anyone for some attention. Lady Grey prefers to have the run of the house and have you in eyesight. She is a bit on the shy side and follows me around. The girl has tried to counter surf once or twice, and probably needs to work on that some more, but she will learn with time and consistency. She hops a bit on occasion when she sees new people. She likes to bark at the dogs when they are playing or she wants their attention. Lady Grey is a sweet girl. She is a joy to have around the house. She doesn't care to be crated and will bow her head down in defeat when I lead her to the crate. She is trying to make me feel sorry for her and it is starting to work. She just thinks she is too much of a princess to be kept in a crate. Lady Grey would do great in a home with or without other dogs of any age or energy level. She should be all right around older children. Right, now, she may be too active for toddlers. I am teaching her not to jump and to stay off the furniture, and she is succeeding. With some maturity and training, she will be fine. She definitely needs to be petted and loved on often, but all greyhounds need that! !